Football is one of the most popular sports in the world and as any other sport has many rules set. These rules have to be observed, failure to which penalties or disqualifications may be incurred. Having many diehards, the parties involved such as spectators, the players, as well as the club managers, have to observe the game rules. Some of these are offside, encroachments and neutral zone infractions. This is one of the laws used to govern the football game. According to the law, a player is in an offside position if it happens that any of the body parts, in exception of the arms and hands are either closer to the opponents’ goal time or half of the opponents’ pitch than the second last opponent, usually the goalkeeper, or both the ball. This penalty is applied if the player gains an advantage by being in such a position or is involved in active play while in such a position. Interfering with an opponent by preventing or potentially blocking the opponent from being able to play or from playing the ball by obstruction. A player can gain an advantage by interfering with an opponent either when a rebound has been played off the goalpost, or crossbar or has been intentionally been saved by an opponent. The term encroachment generally refers to a penalty in American or Canadian football whereby a defensive player makes contact with an offensive player. It can also refer to when a player has a direct path to the quarterback. The penalties for both are classified in the 5-yard penalties. Offside is a situation whereby any body parts of the player, an exception of the arms and hands, are either closer to the opponents’ goal time or half of the opponent’s pitch than the second last opponent, usually the goalkeeper, or both the ball. On the other hand, encroachment is a situation whereby a defensive player makes contact with an offensive player. It can also refer to when a player has a direct path to the quarterback. Rules are essential in any game to ensure a free and fair play. 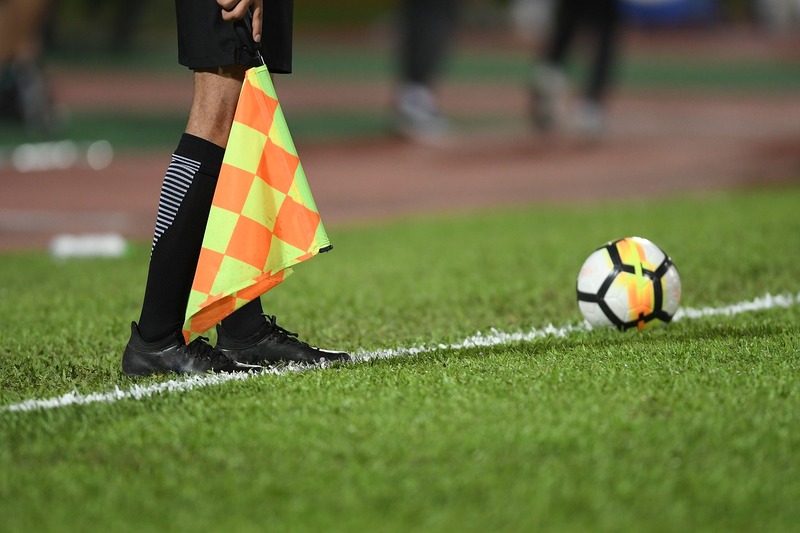 It is also important to understand the differences between an offside and encroachment for both the fans and the players. Observing these rules ensures a fair game, while also helping the players avoid penalties. Tabitha Njogu. "Difference Between Offside and Encroachment." DifferenceBetween.net. 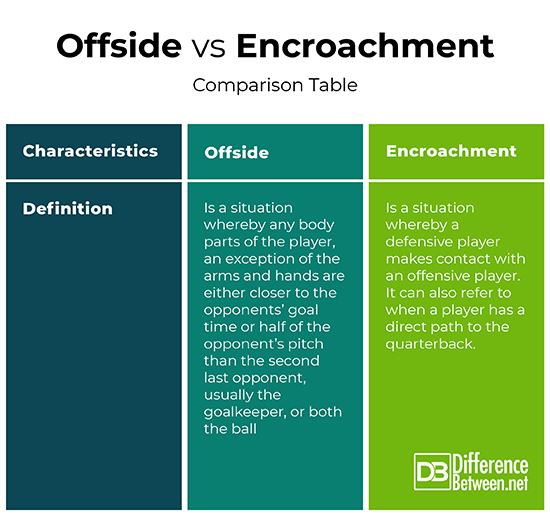 March 5, 2019 < http://www.differencebetween.net/miscellaneous/sports-miscellaneous/difference-between-offside-and-encroachment/ >.